Summers, was an important American Impressionist artist whose home was in Woodstock NY for most of his life, but his painting and teaching career included many extended stays on the east and west coasts, as well as the south, southwest and midwest. Born in Illinois, he studied at the St. Louis School of Fine Arts for four years beginning in 1910, and won three awards in the St Louis Art Guild Exhibitions 1914-1919 plus a prize in the Art Students League, NYC, in 1916. His summer studies in Woodstock began around 1913, and he was able to finance his early years through commissions for World War I officers' portraits and medical journal illustrations. 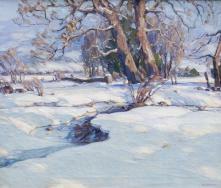 By 1918 he was a member of the Salmagundi Club and moved to New Hope PA. He soon bought property in Woodstock, where he settled and married artist Theresa Jessel Jones in 1920. He became an instructor and by 1930-31 the Director at the ASL's Summer School at Woodstock, with winter visits to Florida and teaching positions also at the Kansas City Art Institute in 1925 and the Charleston SC Art School in 1926-27. In 1932 Summers was selected as a WPA artist, creating for that program a portfolio of etchings of historical landmarks including the New York State Senate House "Old Stone Building", with solo exhibition of his works at Schwarz Galleries. One of his Woodstock snow scenes was chosen for a cover of the 'Literary Digest', and several etchings were featured by Hallmark. Another major commissions in the early thirties involved the interior decoration of the Boston-based luxury ocean liner "Matsonia", with Paul Arndt. John F Carlson took over as head of the Woodstock Summer Schoo,and Summers was happy to expand his circle to include fellow artists working along the east coast from Cape Cod and Cape Ann to Maine in the summer months through the 1930s and '40s. He especially favored Rockport and Gloucester - even renting Emile Gruppe's studio in Gloucester regularly. Winter months in those years offered opportunities for more extended travels, with painting trips to Taos NM and El Paso TX in 1937 and to the California coast in 1937-38, plus a teaching position in Flagstaff AZ in 1939. When the country's stresses through World War II curtailed art sales, Summers continued to find financial support through his mastery of draftsmanship, completing more than ten textbooks of medical illustrations. By contrast with this meticulous work, his painting style nevertheless kept evolving according to his individual Impressionist perceptions, with swift broad brush strokes, bright colors, harmonious proportion of shapes and intense effects of light. By the 1950's Summers was painting mainly in New York and New England again. A major retrospective exhibition of his work was presented in 1989 at Kollar & Davidson in Seattle WA. Ivan's son Carol, born 1925, is an award-winning print maker also. The following is submitted by Cornelia C Moynihan, who writes that the information "is mostly condensed from the Introduction to the Ivan F Summers Retrospective Exhibition Catalog written by Allan J Kollar, Seattle 1989.